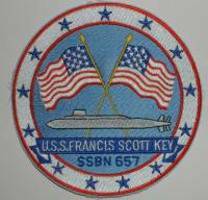 This page is dedicated to the 17 men who were given the honor of commanding the Francis Scott Key. Their unique talents and capabilities propelled them to command one of the nations most powerful deterrent weapon systems which ultimately led to the ending of the cold war. Commanding an FBM submarine, as we all know, is no easy task and one not many men could handle, yet excel. The men listed below did both. 89 - 92 CDR William Rogers Jr.